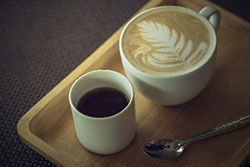 Coffee and tea are versatile drinks. Both can provide an energy boost while serving up interesting and inviting, piquant aromas. Whether it’s to prime the pump to help jumpstart the day or be a small, anticipated treat, coffee and tea work either as a peripheral add-on or the forefront of many a food and beverage occasion. So grab your favorite mug of joe or cup of tea and savor the trends and insights into the flavors and functions of coffee and tea served up by our Hartman Retainer Services’ analysts and consultants.